Line 13x9-inch pan with foil, with ends of foil extending over sides; spray with cooking spray. Add hot water to coffee mix in large bowl; stir until dissolved. Add cake mix, dry pudding mix, eggs and oil; beat with mixer until blended. Pour into prepared pan. Bake 30 to 33 min. or until toothpick inserted in centre comes out clean; cool completely. Melt half the semi-sweet chocolate as directed on package; pour into large bowl. Cool slightly. Add cream cheese product; beat with mixer until blended. Gradually add sugar and cocoa powder, mixing well after each addition. Blend in milk. Use foil handles to remove cake from pan; cut crosswise in half. Stack cake pieces on plate, spreading 1/2 cup cream cheese icing between layers. Frost top and sides of cake with remaining icing. Melt remaining semi-sweet chocolate; drizzle over cake. Looking for a special treat? 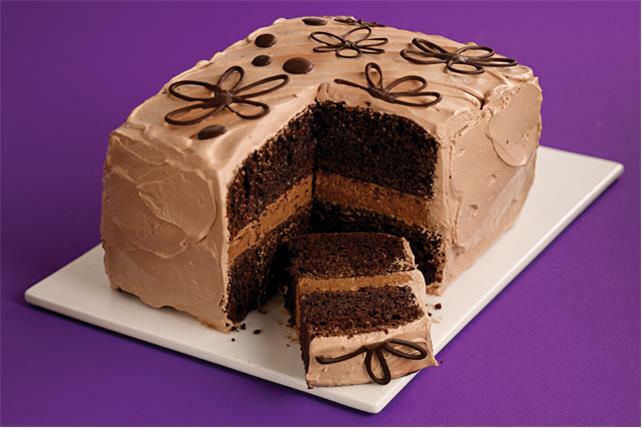 One serving of this cake is full of chocolatey flavour. Garnish cake with chocolate shapes instead of the chocolate drizzle. Melt remaining chocolate as directed on package; spoon into small resealable plastic bag. Press out excess air and seal bag. Cut small piece (about 1/8 inch) from one bottom corner of bag; use to pipe chocolate into desired design(s) on waxed paper-covered baked sheet. Refrigerate until firm. Carefully remove chocolate shapes from waxed paper. Decorate cake immediately or refrigerate, covered, in single layer until ready to use.